» Who Is This Year’s [Insert Free Agent Here]? Who Is This Year’s [Insert Free Agent Here]? That team would not be fun to play against; their front seven would be pretty weak, but Williams and Lofton would be enough to push it toward competency. And tell me you’re stopping that passing game. This team would win 10 games in a bad division, easy. Joseph hit free agency because the Bengals chose to lock up the cornerback opposite him who was perceived to be the slightly better player, Leon Hall. They replaced him with a veteran coming off of a huge deal in the Bay Area, Nate Clements. 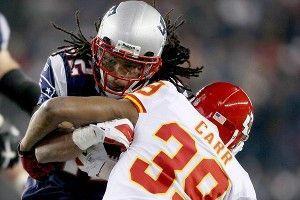 Carr is hitting free agency because the Chiefs chose to lock up the cornerback opposite him who is perceived to be the slightly better player: Brandon Flowers. They’ve replaced him with a veteran coming off of a huge deal in the Bay Area: Stanford Routt. Hmm. Joseph was supposed to be the second-best cornerback in the market behind Nnamdi Asomugha, but he grossly outplayed Asomugha in 2011 and was the dominant force in turning Houston’s secondary from the league’s worst into an impressive unit. There are some observers who think that Carr’s the best cornerback on the marketplace, but it seems like most prefer Cortland Finnegan or even Carlos Rogers to Carr. The Texans benefited from grabbing the younger, more versatile player last year, and at just 25, Carr should still have his best football ahead of him. In Oakland, Asomugha was given one-half of the field and told to lock it down, which he did with aplomb for most of his tenure there. Once he got to Philadelphia, inexperienced defensive coordinator Juan Castillo (watch out, frequently punched walls of Philadelphia) tried to turn him into Charles Woodson 2.0 by moving him into the slot and having him freelance regularly. Asomugha has the talent to do that, but he’s nowhere near as effective when doing so. As a result, the Eagles got very little bang for their buck during a very disappointing season. Jackson’s a perfect fit for the Chargers’ vertical passing attack because he excels at winning jump balls and using his massive frame to box out defensive backs for contested passes. He’s not a crisp route-runner, though, and while he’s capable of making fantastic catches, Jackson doesn’t always make the easy catch. If some team gives him a big contract and tries to push him into a more traditional role, they might end up being disappointed. Moss reportedly impressed the Saints during a Tuesday workout, which has naturally fueled speculation that a year off did much to restore Moss’s health and desire to play the game. Vikings and Titans fans, of course, might suggest that Moss took two years off. We still don’t know what Moss can be at 35, but at the very least, he should still have the leaping ability and body control in the air to serve as a viable red-zone target, just as Burress did this season. Research has shown that running backs who play alongside quarterbacks who are also a threat to run are more efficient and effective than they are playing next to the immobile pocket passers of the world. Assuming that Robert Griffin III ends up playing for the Browns next year, he should end up making somebody’s yards per carry figure shoot up, just as Willis McGahee’s did in Denver this year (from 3.9 in Baltimore to 4.8 in Colorado). Who will that be? That’s impossible to say, but to throw an example out there: Mike Tolbert. Sorry for that reminder, Bears fans. While Barber was once a vicious back who hit the hole with everything he had, injuries took away his acceleration and a lack of versatility turned him into a player whose name was bigger than his actual performance. Grant was a revelation when the Packers nabbed him from the Giants and unleashed him as their starting back for three consecutive seasons, but he didn’t show that same bounce after coming back from ankle surgery last year, hasn’t had a 100-yard game since Christmas of 2009, and isn’t effective as a receiver or pass-blocker. That leaves him as a pure runner who might not have those same skills any longer. Bart Scott was the linebacker who got the headlines in New York during Rex Ryan’s tenure, but Harris was the dominant run defender who really made the front seven go. The Jets would have been lost up front without him, and re-signing him was the best move they made last offseason. (We’ll get to the lesser moves later.) Lofton plays a similar role for the Falcons, and while he’s only an average defender against the pass, it’s incumbent that Atlanta locks up the heart and soul of their defense for the next several seasons. After fellow 4-3 middle linebackers Barrett Ruud and Stephen Tulloch were forced to accept one-year deals last season, the Falcons could try to play hardball with Lofton and hope that he wants to stay in Atlanta, but that’s a dangerous game. Jenkins was dominant in the NFC Championship Game and cashed in with the Eagles, but he never really made his mark as a run defender and interior pass-rusher in the 4-3, and the Eagles restructured his deal after the season. Manningham had that now-famous catch in the Super Bowl, but his mental lapses and maddening propensity for drops led Victor Cruz to pass him on the depth chart as the season went along. Manningham believes that he’s a no. 1 receiver, which seems like a generous read of the situation at best. Rogers’s reputation in Washington was as a competent-at-best cover cornerback who had the worst hands in the history of football, costing his team countless interceptions and turning him into a lightning rod for criticism. After eight interceptions in six years with the Redskins, Rogers had six in 16 games with the 49ers while locking up opposing receivers at a Pro Bowl level. Newman’s frequent injuries and huge salary inspired similar complaints in Dallas, and a nightmarish Week 17 game against the Giants stamped his ticket out of Texas. The Cowboys haven’t officially released him yet, but it’s going to happen. His next team won’t put him on an island quite as frequently and will likely see him as a no. 2 corner, not a no. 1. He can still contribute in that role. Cromartie’s famous 10-interception season in 2007 came about because teams were hesitant to throw at Quentin Jammer, and after playing alongside Darrelle Revis in 2010, he looked like a much better player than he actually was. The holes in his game were far more apparent in 2011. Garcon is an even more egregious example, a guy who was lucky enough to come into the league as a slot receiver with Peyton Manning as his starting quarterback and Reggie Wayne as the team’s top wideout. His catch rates (receptions divided by targets) were always below average for a Colts receiver, though, and despite spending most of 2011 playing in garbage time, that figure fell all the way to 52 percent. That was the seventh-worst rate in the league among receivers with 100 targets or more. Unless Garcon’s bringing Peyton Manning with him, there’s no reason anybody should offer him the five-year, $35 million deal that Garcon reportedly turned down from the Colts. The Jets had no choice but to lock up Holmes, and in doing so they trusted that they could ignore their concerns about his attitude and believe that he was maturing into a better player. They got neither production nor maturity from Holmes in 2011. Johnson doesn’t have the off-field record that caused the Steelers to give away Holmes, but remember that he was benched for most of Week 17 after lifting up his jersey to reveal a shirt that said “Happy New Year.” That doesn’t seem like a huge deal to us, but Chan Gailey thinks it is, and he’s the head coach. It just seems like this could blow up very quickly. Would you give Peyton Hillis more than $2 million right now? Really? Are you the CIA?